Do you want to enjoy the beauty and experience of hiking in the Helen area without the crowds? Located just outside the nearby city of Cleveland, DeSoto Falls Trail is one of northern Georgia's best kept secrets. While major falls like Anna Ruby and Amicalola tend to draw flocks of visitors, DeSoto Falls is a bit quieter. Don't let that fool you, though. The gorgeous falls here are just as stunning to behold, and is surrounded by spectacular flora and fauna, protected by the DeSoto Falls Recreation Area. The hike is manageable for most, offering for fresh air, exercise, and truly incredible scenery on every side. 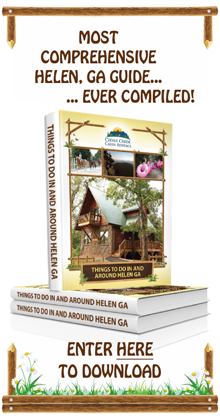 It's definitely worth putting on your "to do" list when visiting Helen. In order to access DeSoto Falls Trail, which begins at the DeSoto Falls Recreation Area parking lot, you'll need to pay a fee of $3 per vehicle for day use. Because the restroom facilities and drinking water are only accessible in the campground near the parking area, you'll want to visit these spots before embarking on your hike. It's always advisable to carry water bottles for everyone in your group, and to bring water and a dish for any dogs accompanying you on the journey. Dogs must be kept on a leash at all times. Be sure to dress appropriately for the weather and for hiking (closed toe shoes are recommended), and to wear sunscreen for protection. Should you desire, you may pack a picnic lunch to enjoy after your hike at the available facilities, or bring a fishing pole to try your hand at catching trout in the river when seasonally permitted. 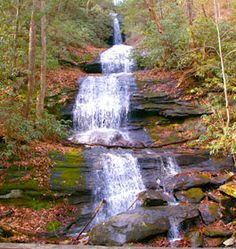 The trip to DeSoto Falls Trail and the recreation area from your Helen cabin is simple and very quick, at just under a half an hour drive time. You'll need to head out west on the GA-17 N/GA75 N before taking a left onto the GA-75Alt N. Follow this for approximately 8 miles before turning right onto the GA-11 N/US-129 N which will take you directly to the parking lot of the recreation area. When you're ready to hit the trail, you'll need to head over to the brown-roofed kiosk that is located in the parking lot. The gravel trail will lead you off on your hike by first dropping and curving throughout the recreation area's picnic area. The beautiful Frog creek will be on your left. After approximately .1 mile, you'll follow the path left onto a paved road through the campground host site and cross a bridge that is constructed atop Frogtown Creek. After you've traversed the bridge, you'll notice that the trail splits. Both paths offer unique views of the falls. By taking a left, you'll enjoy a short and easy to moderate switched-back trail that will climb to the lower falls. After some time, you'll come upon a large crock outcrop, whereupon the path will shift to the right for the final 50 foot ascent to a viewing plantform that's situated right underneath the waterfall. At this point, you'll need to head back to the starting point at the bridge, and follow the straight path. This trail was once an old logging road. The path follows a wide floodplain of the river. Once you see the place where a tributary meets Frogtown Creek to your right, you'll begin to make the ascent up three separate climbs. 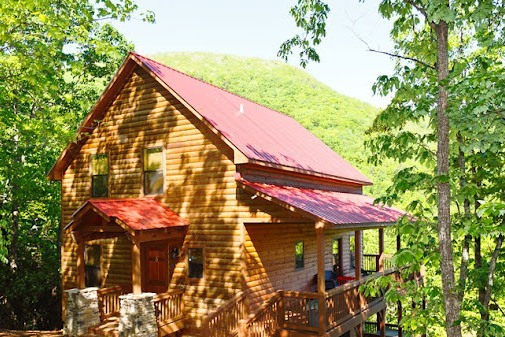 As you hike upward, you'll be able to enjoy occasional views of the waterway. After 1.4 miles, you'll cross another bridge and will be able to see the falls to your left. The trail doesn't loop, so you'll need to retrace your steps to the parking lot, making the whole hike approximately 3 miles. For obvious reasons, the falls themselves are the biggest draw to this enjoyable trail. In order to get the best photos of the falls and experience it from all angles, you'll want to be sure to follow both of the trail's paths and stop at both of the viewing platforms. From the lower falls platform you'll be able to see a combination of both free-falling water and steep cascades, plummeting around 35 feet into a small pool. On the trail leading straight, you'll enjoy massive strands of rhododendron covering the path. The viewing deck allows hikers to see the falls beginning a straight drop from a ledge's center, and passing over three ledges below. Note that due to safety conditions, the trail to the upper falls remains closed at this time. Do you plan on making a day of it and spending time exploring the rest of DeSoto Falls Recreation Area? Feel free to ask us any questions about the area and we'll be happy to get back to you with helpful advice and answers.